I mentioned in my Daybook post last week that I had a couple pieces of furniture painted "Shabby White" - our old hutch and a little fireplace that we were given by a friend. The painter was able to finish them quickly and they were delivered on Monday evening while I was in town with the kids. We were so excited to see them when we got home! They look quite different, and have taken me a little getting use to, but I think I love them! :) I love our tan walls and dark wood floors, but the room did need a little brightening up and this seems to have really helped. We ended up leaving the mirrors out of the top cabinets, but we do have the option of adding them back, if we change our mind. Hubby's response was: "Well, it definitely looks 200 years old. . . "
Snuggles response: "Oh! It's Layla's Candy Shoppe!!!!" 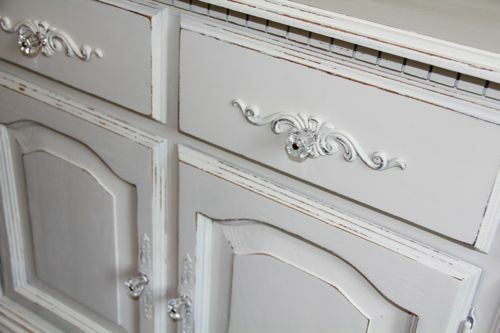 I just love the little swirly appliques and hardware that the painter added. 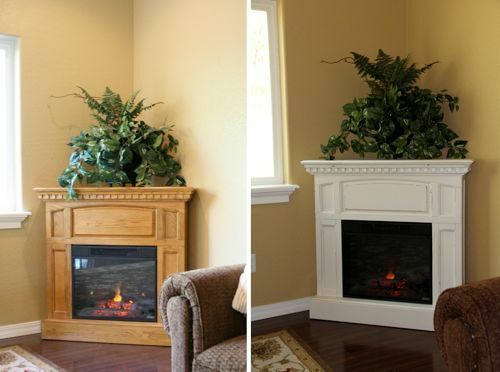 And here is a before and after of the little corner fireplace! Now if I could just figure out what to put in the hutch... Any suggestions? what did you have in the hutch before? I have dishes in my hutch...but do you have any collections of any kind that would look nice displayed there? I had all of our China and Wine Glasses in it, but now they are in the cabinets in the kitchen with the glass doors. I have a beautiful wooden hutch in my living room that came with me to my marriage. I have some beautiful glass and ceramic pieces (not expensive, but sentimental) that I have collected over the years, but I think the most beautiful things I have in there are my saint statues and a couple Willow Tree figurines that my mom and husband gave me. The one thing that stands out and catches my eye everytime I walk past is the icon on a little standing picture frame. Its bright colors really stand out. I hope that helps. Love them! Can't wait to see them in real life. They are beautiful, Jessica! I have a teapot collection and some tea cups and saucers -- they are all different and mostly from thrift or antique shops that I have picked up over the years. I would love to have a dedicated spot that like. Mine are on shelves and scattered all over. LOVE THEM!! They are SO cute! Now... what to put in that hutch!?! What about some items that you use for school work that are pretty, too? Like your little glasses with colored pencils, or the little wooden stand with the priest's vestments for the current liturgical season, or maybe a few of your beautiful smaller books. Perhaps you could add a photo frame or two with your children using some of these beautiful things. Then, there are all kinds of other beautiful items located all around your home!! OH, how I wish I was there to come help and have FUN!!! :) I am sure that you will find many things to fill it up with if you don't have a collection that you would like to put in there!! Wow! They look amazing! 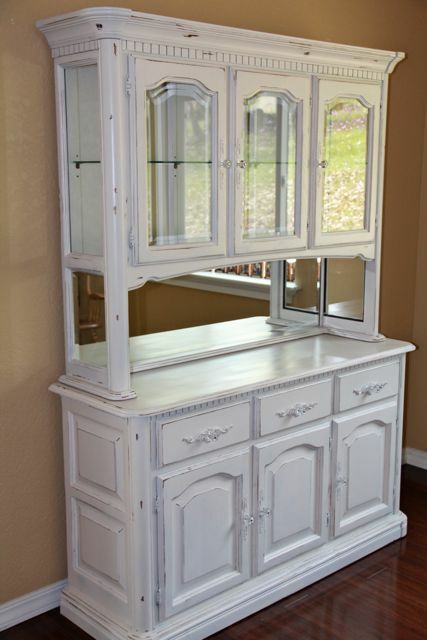 The hutch looks like a completely different piece of furniture! I love the antique appliques the painter added ... And you have gotten a lot of great ideas of what to display in there from other readers! =) I will look forward to seeing what you decide to do, if you decide to share with us! They look great! Love the little crystal door knobs! I love the shabby chic look. You can fill it with just about anything. Things that mean something to you or can be grouped together (as if they tell a story) would look nice. Thank you all for the comments and great ideas! I will post a picture once I figure out what to put in the cabinet. I think it could be really pretty. I have little statues and breakable religious art in my kitchen hutch. Also have ones with various mugs that we've bought on vacation, etc. Although anything would look nice in yours - plants, books, photos. I once knew a family who had a glass display case with old toys from their childhood. It was very cute! I am partial to white, luv the look. And I agree with the ideas of saint statues and/or tea cups and to add,candles. WIth the mirrors, it would be perfect to fill the cabinet with items that reflect a pretty back and catch the light. Your dh's comment made me laugh. :) When we had our kitchen remodeled, we got cabinets with "distressing" done...my dh said, "we're paying extra to make them look old and dirty?" Jess, I would fill the hutch with your favorite things, a little glass, some books, wedding photo or kid shots, maybe a small dried flower bouquet , a little silver. Maybe some antique china cup and saucers, teapot, or chrystal or something of value from your grandmothers. But first line the back with some ticking or some other fabric. It's a great piece.